GOAL: To provide 911 staff including administrators, dispatchers and call takers the opportunity to learn more about the services and function of the Upstate New York Poison Center in an effort to increase utilization of the poison center while reducing unnecessary hospital transports. WHO: This training is designed for Public Safety Access Points in the Poison Center’s 54 county coverage area (click for map of service area) in order to reduce costs and protect valuable community resources. 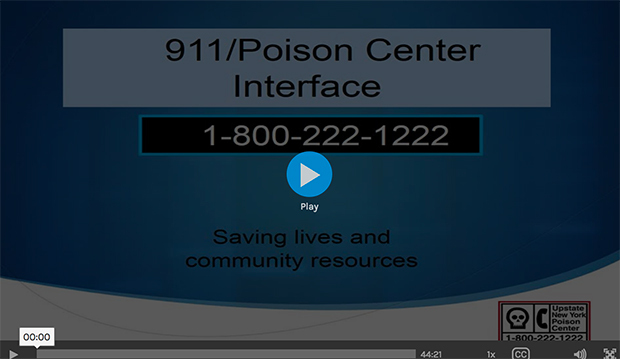 WHAT: Training targets the interface between the Upstate New York Poison Center and 911 when poison calls come into the 911 Center. WHY: For many years, the Upstate New York Poison Center has traveled throughout its service area to provide this training to 911 staff. Now based on requests to increase ease of access, we are making the training available online. WHERE: Now available at your site with no need for external scheduling logistics. ACT: View the video to see if this online training might be a valuable tool for your 911 Center. When clicking on the video, you will be asked the name of the county that houses your 911 Center and if you are just browsing or if you are using the video for training purposes. We welcome both. PLEASE take a minute to respond, to help inform our outreach efforts. Last Modified: October 26, 2018. Contact Lee Livermore with questions about the content of this page.